Hollywood has officially gone overboard. Collectively we've both rejoiced and lamented their ongoing trend of remaking, rebooting, and sequeling every film, TV show, and comic book franchise we grew up with. Things that have been proven in the past have proven to be audience pleasers in the present, for the most part anyway. But when will they exhaust the best possible material? And how much is too much? While I'm not in the camp that believes this trend signals the death of creation, inspiration and imagination, yet I do think some things should stay in the past. Some projects, like this one, could very well be destined for failure from the start. 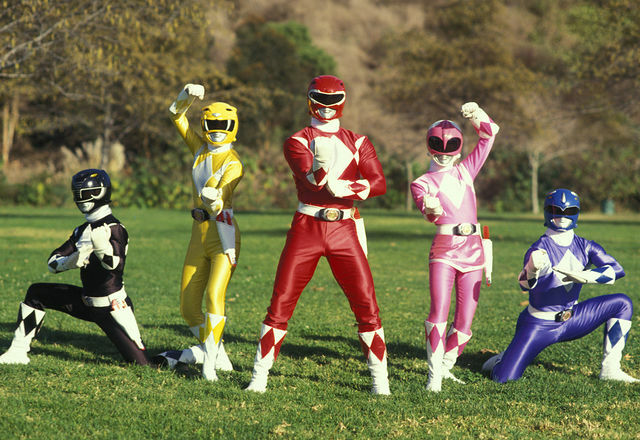 Power Rangers is the type of property that had its day back in the 90's (with rebooted series here and there ever since), but it is ostensibly made for a younger audience. And I'm not convinced it needs to be remade for adults. Yet we now live in a world where we've already seen a dark, gritty version of the franchise. It was, I think, well made and an interesting take on a futuristic world, but was not recognizable as the franchise it was attempting to reboot. Those that own the franchise took offense to the ultra violent and mature use of their property even going so far as to post take down notices on all places the video was posted. It would seem that even if the original audience for the show has grown up, the powers that be don't want to see the franchise grow up as well. So what sort of film will we see? The director for the film is listed as Dean Israelite, whose only recognizable film is this year's "Project Almanac," a film I have (as of this writing) yet to see. It's being written by Ashley Miller and Zack Stentz who, as a team, do have a solid track record with films like "Thor" and "X-Men: First Class" for their writing credits. They're also teaming up for two other reboots/sequels in "Top Gun 2" and "Big Trouble in Little China," both of which are set for 2016 releases. Nevertheless, their inclusion in the project does lend some form of legitimacy to things, but it's also certainly no guarantee of quality. While I won't rule out the possibility of a good reboot, and I certainly won't rule out the possibility that it could be a solid money making machine, the question remains, is it even necessary? The original show was a cornball campfest starring teenage actors (or young 20 somethings) in tight spandex and over-sized helmets doing gymnastics while miniature explosions signified damage being done to them or their enemies. Each episode inevitably came down to their enemy growing into a godzilla-like monster portrayed by a man in a goofy looking mascot costume marching around a miniature city set while more miniature explosions went off all around. This, of course, lead to the rangers joining their various animal themed robot/vehicles into one giant robot. The ultimate act of teamwork, as if to say we can only do this together. As strange as it sounds it was an entertaining show to come home to after those long grade school days of my childhood. Yet it does not seem to lend itself to a dark, gritty theatrical reboot, which would stray too far from its origin. There's also the question of special effects. A feature length film version of the franchise likely (hopefully) wouldn't stick to the TV show's hilariously campy effects, but 2015 has become the year of the return of practical effects with such films as "Mad Max: Fury Road," "Mission: Impossible - Rogue Nation," and the upcoming "Star Wars: The Force Awakens." We can only hope this trend will grow in the coming years. Audiences are tired of films that have become so overtaken with CGI that they're borderline animated films. A Rangers film could struggle if it's overridden with CGI (particularly if it's shoddy). There are still Rangers TV shows, but they continue in the campy tradition the series has always had. A film version of that tradition would not do well at the box office. While the owners to the franchise clearly don't want to see a mature film, it's clear they can't (and shouldn't) make one in the way they've been making their TV series. Yet the TV series is what the franchise has to offer. It is what it always has been. So do we need an adult version of it? I, for one, am quite alright with leaving the series in the past. A memory of a show that served its purpose as childhood entertainment. For now it's listed as a 2017 release.